IDEC RJ series of relay sockets are ideal for space saving applications with a width of only 12.7mm DPDT or SPDT. These sockets are designed with numerous features, making them user friendly. The sockets can be mounted on the panel, DIN rail, or PCB. IDEC sockets are engineered for use with IDEC relays and timers, but will perform just as well with any fitting component. 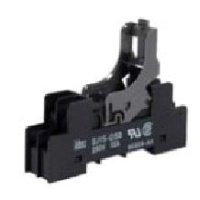 ECD has a large inventory of IDEC Relays and RJ Sockets in stock and ready to ship. Call ECD today for all your relay and socket needs.